I really found this book interesting. It also brings up some questions. I mean I can see both sides. I can understand why the family was somewhat confused. At times angry with what was done with their mother’s cells. At the end of the day, I guess what happened wasn’t done intentionally. I found the epilogue at the end the most interesting of all. That’s where all the real ethical questions come into play. If you read this book and decide it’s not for you part way though, well, I encourage you to just skip to that part and read it. Here’s my thoughts…of course, it would only be in a perfect world that my thoughts could come to life…so there is that…. There’s no doubt that things like this should continue on. The things that have been accomplished because of Henrietta Lacks cells are just mind-blowing. I mean, honestly, it’s just amazing. Things like this have always went on, but the public just isn’t aware of it. The scientists that used her cells did so with no intention of making a profit. At some point was profit made? Sure, you bet your arse it was. That’s where it needs to stop. It’s also noted that a few different researchers with different cells are not limiting any research and refusing to allow others to do their research. This is wrong. If a patient can’t control the rights or make profits off of their cells, why should a company or pharmaceutical company do so? I’m afraid that as time goes on, more pharmaceutical companies will control more of these things. They will not give samples, that cost them nothing, to further research. Instead they will control it and only let them out to the highest bidder…or not at all…simply to protect their own interests…and this is where the world will suffer. If we expect the people who give these samples to receive no recognition or profit, then by damned, companies shouldn’t either. Companies should not be withholding samples to scientists for further research…..Once you allow them to control these samples you are allowing them to delay vital information that could provide cures for many diseases. Of course, cures means less profit for these companies, so it’s really in their best interest to regulate what is released. This, IMHO, is a recipe for disaster. Bottom line, I really encourage you to read this book. 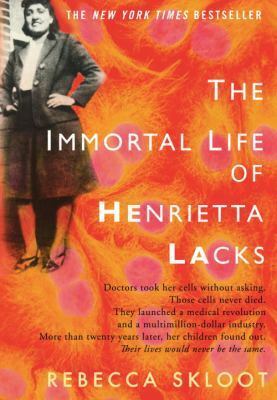 Yes, the book is slanted towards Henrietta Lacks’ family. However, that doesn’t change the fact that many people have no idea of what happens when they give a sample of blood. Of that tumor cell that was removed from them during surgery. Of placentas that are delivered with their children. It’s just mind-boggling. I’ve also read this book and reviewed it:)). You’re right – it is very slanted towards Henrietta’s family, but of course in the power stakes, the bits of information that filtered down to them caused them great grief and unhappiness. It is certainly a compelling read – and one that still haunts me years after I read it… No wonder Rebecca Skloot devoted so many years to it. Thank you for sharing your review. Great review of the ethical dilemas! I actually found that Skloot did a nice job of keeping neutral. I mean, she became so close to the family, it had to be hard not to completely side with them. I liked that she didn’t throw Gey under the bus like she totally could have. I wish she would’ve gone into the ethics of Elsie’s case at the insane asylum, but alas, that could be a book on its own!